Alzheimer's disease is an irreversible, progressive form of dementia that affects more than 5 million Americans (HHS, 2012). It slowly destroys memory, thinking skills, and eventually the ability to perform activities of daily living (ADLs). People with Alzheimer's disease are often reliant on others for their daily care and are heavy users of medical care and long-term services and supports (LTSS) (Tilly et al., 2011). Over 40 percent of nursing home residents have a diagnosis of dementia or Alzheimer's disease. As a result, Alzheimer's disease has an enormous impact on both affected individuals and their caregivers. Given the projected growth of the elderly population and the high prevalence rate of Alzheimer's disease among older Americans, the number of affected individuals is expected to increase by 40 percent between 2000 and 2025 (Alzheimer's Association, 2013). People with Alzheimer's disease depend heavily on Medicare and Medicaid to finance their LTSS and medical services. An increase in the prevalence of Alzheimer's disease will increase the demand for care and Medicare and Medicaid expenditures. People with Alzheimer's disease frequently need care from a wide range of providers, from nurse aides and home health care workers to geriatricians and psychiatrists, but care is often provided in a fragmented and uncoordinated fashion (Alzheimer's Association, 2013). Care coordination has the potential to address the multidisciplinary needs of people with Alzheimer's disease and informal caregivers and improve health outcomes for both parties. It may also reduce Medicare and Medicaid expenditures by eliminating unnecessary care and by encouraging services that keep people healthier. Care coordination is a widely used but ill-defined term. For people with Alzheimer's disease, a care coordinator typically is assigned to a person/informal caregiver and becomes responsible for managing services for the person with Alzheimer's disease, providing support to their caregivers and coordinating the use of medical care or LTSS. The goal of this literature review is to better understand existing care coordination models for people with Alzheimer's disease and related dementias and the effects of these programs on outcomes, including use of medical care and LTSS, expenditures, and psychosocial outcomes such as quality of life on people with Alzheimer's disease and their caregivers. The reviewed studies used different terminology to refer to the intervention, including case management, care management, disease management, and care coordination. 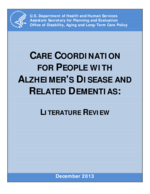 For the purposes of this review, we use the term care coordination to refer to all of the interventions. We particularly focus on the coordination of medical care and LTSS.